Please allow yourself 15 to 30 minutes to get this set up, depending on how at ease you are with setting up an online account. First things first... check your email from January 21 to find your invitation to set up your daughter’s account. The sender shows as ‘sportfunder’. If you did not receive an email, please contact fundraising@glcof.com to get a new sign up email generated. · A photo file of your child already selected to for uploading. · Your Facebook, Twitter and LinkedIn account urls handy to link to. · Contact emails to upload or type into Sportfunder.com. Under your user name at the top right hand of the page is a blue drop down menu. Click on Settings and a white box pulls up. Under the My Profile tab fill in the blanks/drop down tabs. · NAME: the name you want to use for your campaign… the player’s name or nickname, your family’s last name or fun name of your choosing. · You will use the email and password used to set up the page. · The profile picture defaults to the Fury logo. You can upload a photo of your daughter instead. · The cover picture is defaulted to a group photo. You can upload your own photo here, too, but it must be a 16:9 ratio or else the photo will look distorted. · Make sure the ‘allow contributions at all times’ box is clicked. · Click SAVE button after updating. · Paste in the direct links to your social media profiles you want to connect to Facebook, Twitter, Instagram. Leave the field blank for any social media channel you don’t want to link to. Account tab and FanPage tab…. 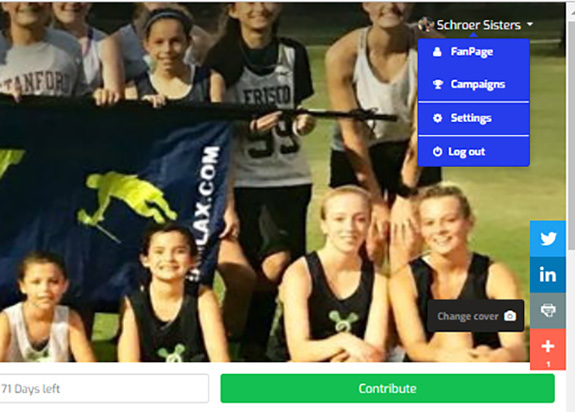 · Any donations made through your page automatically are directed to the Girls Lacrosse Club of Frisco account. 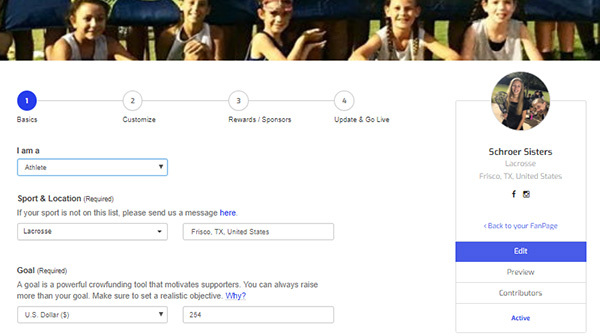 This is the Dashboard to your Frisco Fury fundraising page. You can add as much or as little to this as your time and interest allow. 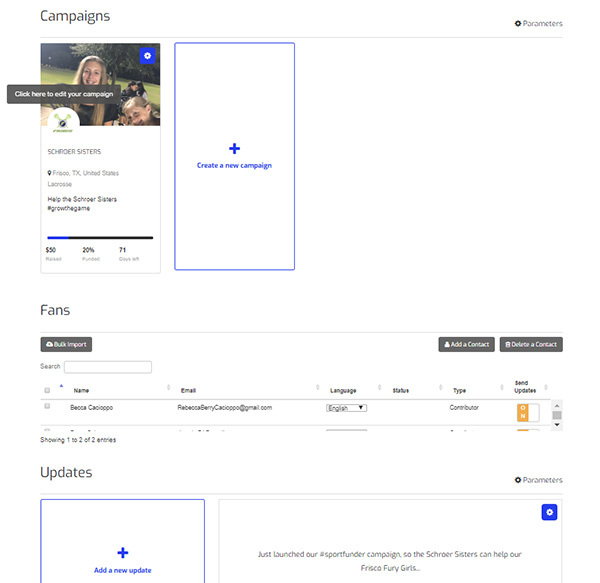 · FANS section is where you can upload contacts to send an email campaign. You will want to set up these contact first before getting your campaign email typed. · UPDATES shows the posts/emails you’ve already sent and is where you can click to ‘add a new update’. · Auction Items & Sponsors – please do not set up this info. These are already set on the master Frisco Fury Lacrosse page. · Any other areas of the page are up to you to fill out or not. While they make for a really robust profile for your athlete, these fields are not necessary to run your $127 campaign. 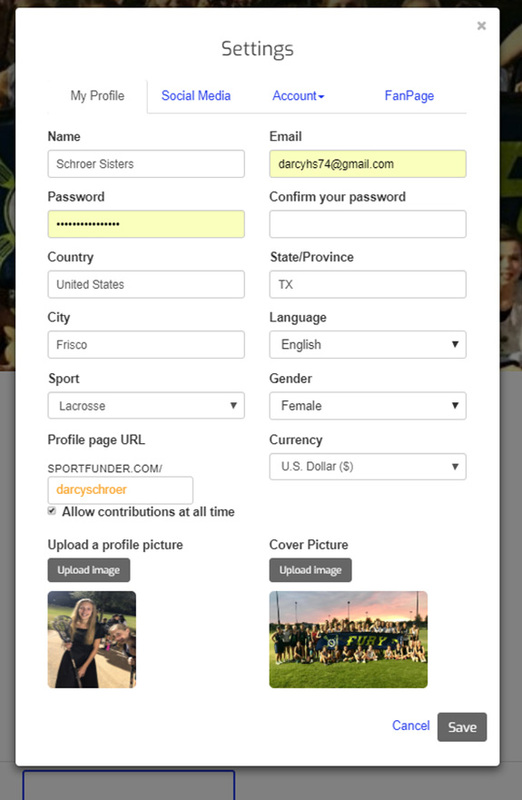 · Set your box fields (if not already defaulted to these) to athlete, lacrosse, Frisco, TX. 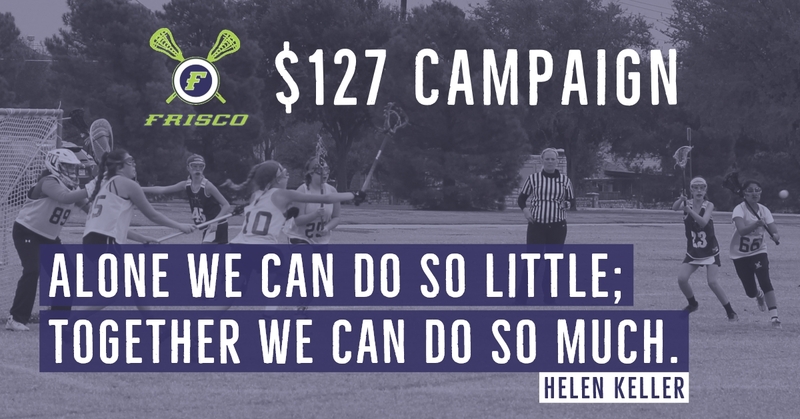 · Set your Goal in US Dollars for at least $127 per Fury player in your household. · Profile picture was added when you managed settings. You are welcome to change anytime you want. · Campaign Title: Personalize it if you want to. · Description: There is a template already set, which you can update with any other personalized info you want to include. · Campaign thumbnail: keep default or add your own. · Please leave the video URL, Event, as is. · Social Media links should be the urls you linked to your personal account in Step 3 Settings. · Click on SAVE and Continue when you’re done. · DO NOT ADD ANY INFO HERE! · Make your first update. · Click on the location(s) to send your update: Facebook, Twitter, Email: when selected the icon will turn blue. · Add a photo, image or video to go with your update. Visuals are what make your donation request post interesting to click. · If you correctly linked your social media and uploaded your fans in Step 3 & 4, your update automatically posts and sends. · Click on Post & Go Live! CONGRATS! You activated your campaign. Add additional updates frequently. Same steps as sending your first update above. · Can do this under campaigns or from your CAMPAIGNS or FAN PAGE.